SKU: SKKMTKS3. Category: Apparel. Tags: Childrens Fight Shorts, Kids Kickboxing Shorts, Kids Muay Thai Shorts. 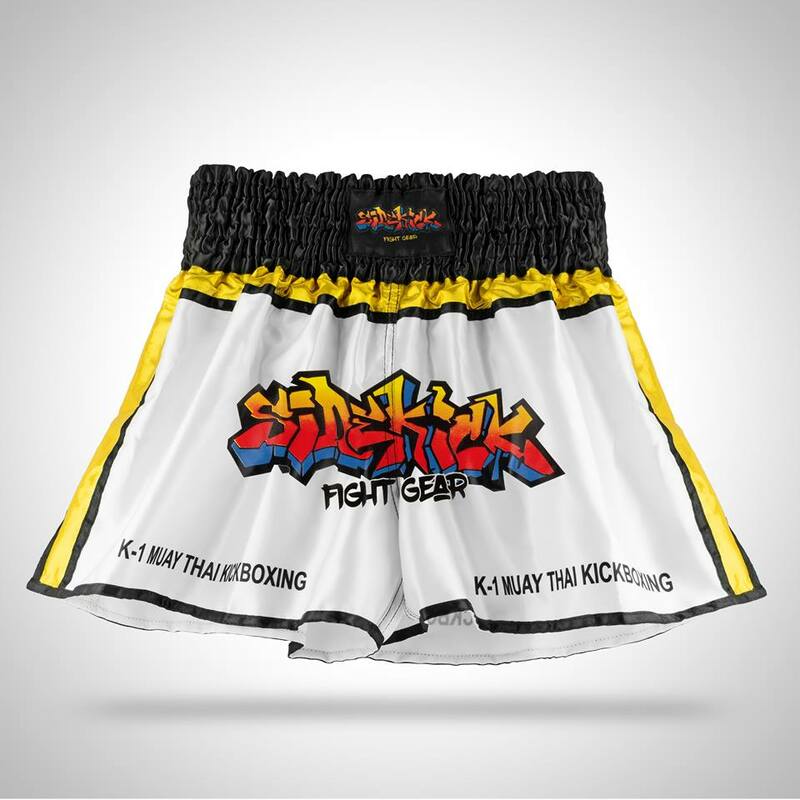 With these professional Sidekick kids 3.0 Muay Thai Shorts, you will be able to throw those stunningly high head kicks as a result of the extra movement in the v-cut sides. This means that these dynamic shorts are designed to be the perfect activewear for combat sports, especially muay Thai and Kickboxing. A comfortable- as well as high quality- product, these stunning shorts have an intricate and well-thought out design as well as being made from a wonderfully glossy satin material for extra comfort. Even with multiple washes, these impeccable shorts feature a sublimated print that won't crack or fade with time, meaning that they stay looking as fresh and new as the day you bought them! With a wide elasticated waistband and finished in white with luxurious gold panelling, these professional Sidekick 3.0 Muay Thai Shorts will give you the comfort and determination to achieve great success in all your muay Thai and Kickboxing ventures! With these professional Sidekick kids 3.0 Muay Thai Shorts, you will be able to throw those stunningly high head kicks as a result of the extra movement in the v-cut sides. This means that these dynamic shorts are designed to be the perfect activewear for combat sports, especially muay Thai and Kickboxing. A comfortable- as well as high quality- product, these stunning shorts have an intricate and well-thought out design as well as being made from a wonderfully glossy satin material for extra comfort. Even with multiple washes, these impeccable shorts feature a sublimated print that won’t crack or fade with time, meaning that they stay looking as fresh and new as the day you bought them! With a wide elasticated waistband and finished in white with luxurious gold panelling, these professional Sidekick 3.0 Muay Thai Shorts will give you the comfort and determination to achieve great success in all your muay Thai and Kickboxing ventures!